I hope you are all well.Today i want to share my attempt on a white on white card not something that I do very often but i think it turned out ok. I have used this sweet little stamp from the Craft Stamper magazine which was a freebie a while ago and the beautiful sentiment is from whimsy stamps.The dies I have used are spellbinders fleur di lis and nesties circles,marrianne dies swirl die and heartfelt creations posies die.Also used are dotty embossing folder from cuttlebug,gems,ribbon and card candy which I was lucky to win a whole store full of beautiful colours this week on the very talented Kath and Buddy's blog thanks guys I love my prize.I have also used some diamond stickles too. I hope you like it I had to put a piece of green card behind the card so you could see it better but there is no green on my card. This is beautiful! I love white on white cards! The white on white turned out beautifully. 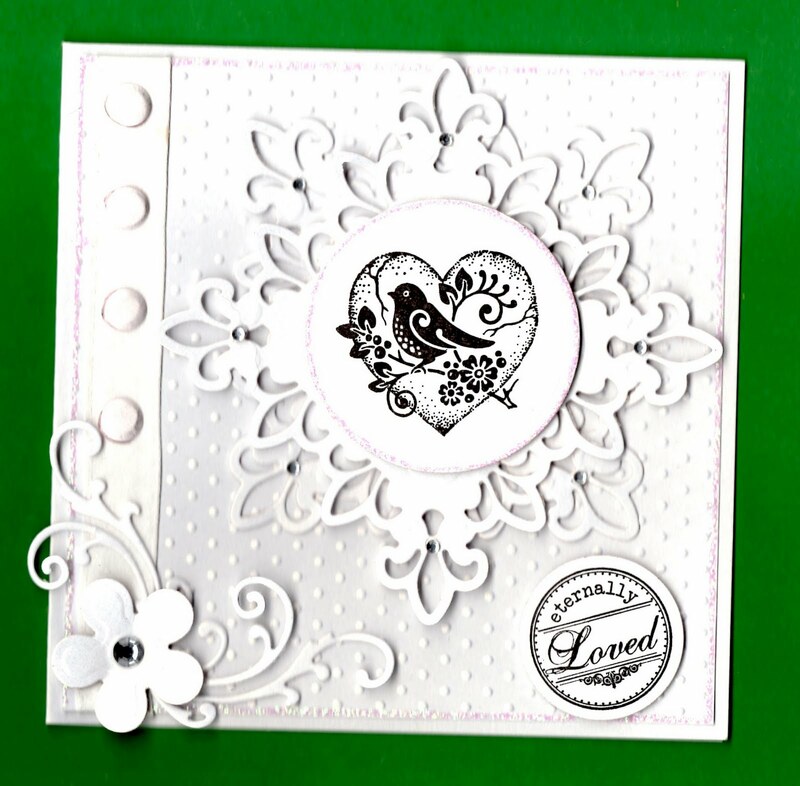 Love the texture you added with the embossed dots and the dies look gorgeous. Thanks for joining us at CES challenges this week. I like the way the Fleur de Lis ornate die picks up the leaf shapes on the stamp. I love these images of Glenda Waterworth's but must admit I'd not thought of making a WOW card with them. Wow Lorraine you have done a wonderful job with this beauty. I have been tempted to try one of these but haven't quite plucked up the courage, you have done a terrific job, the embossing that little image and design work perfectly. Gorgeous and bright! Thanks for playing with us at Wee Memories!!! Hi Lorraine, it turned out so beautifully. Love the image and gorgeous details. I sure after joining the Polkadoodle Challenge, you will enjoy lot. The white on white turned out beautifully. The texture you added with the embossed dots is marvelous and also looks gorgeous. A beautiful card, thanks for taking part in the Polka Doodles challenge. This is a real stunner Lorraine. The stamping and embellishments are beautiful. Thanks for taking part in the Polka Doodles Whiteout challenge and good luck. I love all-white cards, and this one is truly amazing! BEAUTIFUL... so very elegant looking. The impact of the black stamped bird in the middle is fab! Thank you for entering the Marianne Design Divas challenge.